Posted in: Journal Club. Tagged: close-in planets, exoplanets, tidal evolution, transiting planets. With the very first discovery of an exoplanet around a Sun-like star (51 Peg b), astronomers were introduced to hot Jupiters. These totally unexpected planets resemble Jupiter in mass, composition, and size, but they have orbits that nearly skim the surfaces of their host stars. Some of them are even losing their atmospheres under the apocalyptic glare of their host stars. How their lives began remains a mystery, but we have a pretty good idea of how their lives will end – they will be engulfed or torn apart by their host stars. That’s because hot Jupiters are big and close enough that they can actually raise a tidal bulge on the stars (and we can actually see the bulge in a handful of cases). This tidal interaction can cause the planets to spiral downward toward the stars, and at the same time, it causes the spins to spin faster until the planet is destroyed by the star. The same tidal effect, just in reverse, is driving the Moon away from the Earth, while slowing down the Earth’s spin. But here’s the key: we don’t know how quickly the planets are spiraling in. Tidal decay of planetary orbital period over billions of years (Gyrs). From Penev et al. (2018 – https://arxiv.org/abs/1802.05269). Enter Prof. Kaloyan Penev of UT Dallas Physics Dept. On Valentine’s Day last week, he and his colleagues published an academic love note exploring planetary tidal decay. To do this, they modeled the evolution of planetary orbits and stellar spins under the influence of tides. The tracks in the figure at left show how a planet’s orbital period (or distance from its star) might shrink over billions of years, thanks to tides. The clump of spaghetti noodles in the figure shows that evolution for a range of assumptions about the rate of decay. 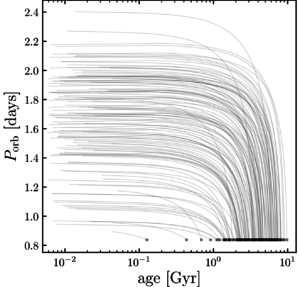 By comparing the stellar spin rate and planetary orbit predicted by their model to those we actually observe for each system, Penev and colleagues showed that the tidal decay rates might actually slow down as the planets approach their stars. So perhaps instead of an reckless death dive into the star over a few million years, the planets make like Zeno’s tortoise and tiptoe closer and closer without plunging in. Upcoming surveys such as the TESS mission and the Large Synoptic Survey Telescope may soon allow us to test whether planets do or do not plunge into their stars. Theoretically, we expect stars that eat their planetary children dramatically brighten up by a factor of 10,000 over a few days – faster than a supernova brightens but nowhere near as bright. These surveys might able to see stars engaged in this act of cosmic infanticide. Posted in: Journal Club. Tagged: exoplanet, hubble, transits, trappist-1. Comparing the TRAPPIST-1 system to the solar system. From http://www.spitzer.caltech.edu/images/6294-ssc2017-01h-The-TRAPPIST-1-Habitable-Zone. In astronomy, when you look for evidence supporting a hypothesis and don’t find it, that’s called a “null result“. The null result is usually not all that exciting, but last week, an attempt to detect the atmospheres of potentially habitable exoplanets came up null, and that, as it turns out, may mean the planets are habitable. 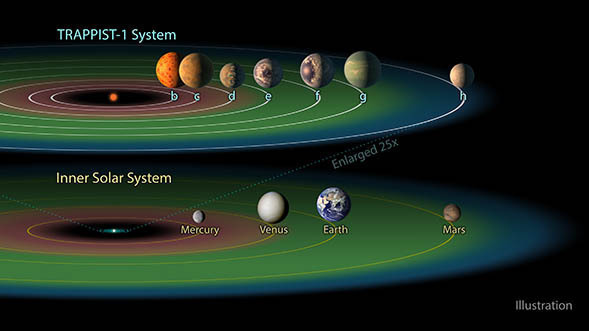 In a recent study published last week in Nature Astronomy, Dr. Julien de Wit of MIT and colleagues observed the transits of four of the planets in the TRAPPIST-1 system. The discovery of this system was announced last year and generated a lot of interest — it comprises seven Earth-sized planets orbiting a red-dwarf star, and at least four of the planets orbit in the star’s habitable zone. So astronomers are scrambling to determine the climatic conditions on these planets and find out whether they host life. Key to those conditions is the composition of the planets’ atmospheres, and the best way to probe atmospheres lightyears distant is to detect the colors of the planets’ shadows as they pass in front of their host stars, i.e. as they transit. When light from the star passes through a planet’s atmosphere, the cool gases can imprint spectral signatures, which we can then detect using a very sensitive telescope — de Wit used the Hubble Space Telescope. Now, even though the TRAPPIST planets are Earth-sized, that doesn’t mean their atmospheres are Earth-like — astronomers have founds lots of weird planets in the last several years. The atmospheres could be hydrogen-rich like Jupiter, hydrocarbon-rich like Neptune, or rich in nitrogen and oxygen like Earth. In principal, each kind of atmosphere would give a distinct spectrum, but in practice, atmospheres rich in hydrocarbons or nitrogen, potentially good atmospheres for life, are difficult to detect because they are weighty and drape over the planet like a heavy blanket. By contrast, a hydrogen-rich atmosphere, although probably not great for life, can be light and fluffy, relatively easy to detect. When de Wit and colleagues analyzed transit data they collected from Hubble showing transits for planets TRAPPIST-1 d, e and f, they found no atmospheric signals down to their detection limits. The spectra below show this lack of atmospheric coloration and what they would have detected if the atmosphere was hydrogen-rich. Now, of course, this non-detection does NOT mean the planets are habitable or even Earth-like. As the figure shows, their atmospheres could still be radically different from the Earth’s (drenched in water vapor or carbon dioxide-rich like Venus), but it rules out the possibility that they are Jupiter-like — potentially good news for life there. Very likely, when the James Webb Space Telescope finally launches next year, the TRAPPIST-1 system will be one of its first targets. JWST’s vastly improved sensitivity will help reveal not just a potent null result for the TRAPPIST-1 system but may also reveal the glimmer of distant Earth-like worlds. 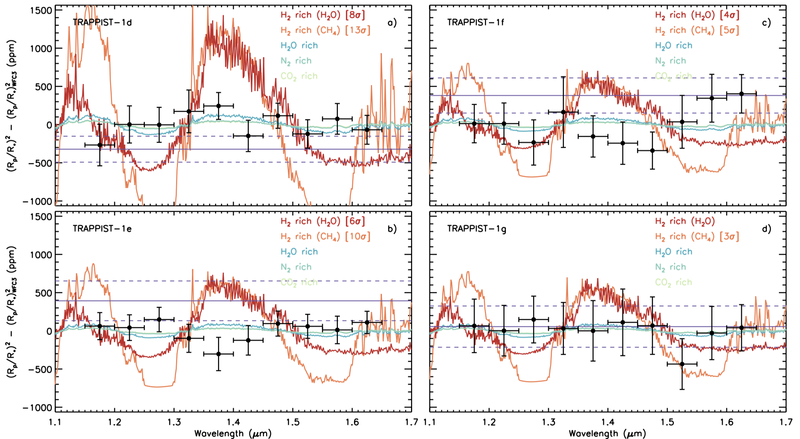 Spectra for TRAPPIST-1 d, e, f, and g. From de Wit et al. (2018) – https://www.nature.com/articles/s41550-017-0374-z. Posted in: Public Outreach. Tagged: dust devils.